Smith Optics re-launches http://www.opticallydelicious.com/ with emphasis on new sunglass lens technologies KETCHUM, IDAHO (June 14, 2006) – Expanding the reach of an extremely successful winter micro-site, Smith has re-launched http://www.opticallydelicious.com/ to include new sunglasses, new technologies and new terrain. Originally created to help consumers pair the right choice of Smith’s industry-leading goggle lenses with different winter conditions, http://www.opticallydelicious.com/ now does the same for Smith’s extensive sunglass technologies including Photochromic Polarized, Photochromic and Polarized. “This is an incredible tool for anyone wanting to learn more about Smith Optics’ lens technologies and the benefits of polarized and photochromic lenses,” said Tag Kleiner, Smith Optics’ Marketing Director. 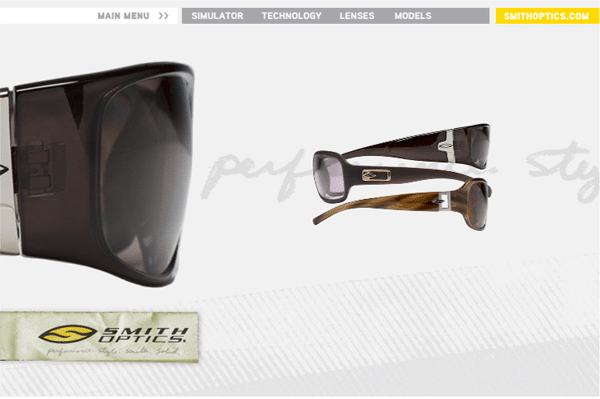 “Our goal is to educate the consumer about the amazing lens technologies we offer and help them find the right pair of shades for their lifestyle.” The site can be explored in a variety of different ways including a Simulator Section where you can choose from a range of terrain options and manipulate light conditions to see how Smith Optics’ industry-leading lenses react, a Lens Section where the you can sort all Smith Optics’ lenses by Visible Light Transmission (VLT) or Color Family and a Models Section to check out the assortment of models that are available in each lens technology. The range of terrain simulations include open water, beaches, dirt and asphalt and can be adjusted from low light to extreme bright conditions. Each can be paired with a Smith lens technology and seen as it would look through photochromic polarized, photochromic or polarized sunglasses. ABOUT SMITH OPTICS; Based in Sun Valley, Idaho, with a Southern California office located in San Clemente, Smith Optics, Inc. was founded in 1965 with the creation of the first goggle featuring a sealed thermal lens and breathable vent foam. Today, Smith is as well known for its diverse line of fashion and performance sunglasses as it is for its goggles. From Smith’s distortion-free Tapered Lens Technology to the versatility of the Slider Series, with its patented, interchangeable lens system, the devotion to excellence, innovation and style is what has made Smith goggles and sunglasses the choice of action-sport athletes worldwide. Smith products are sold in more than 50 countries through sporting goods and specialty stores. For more information visit http://www.smithoptics.com/.